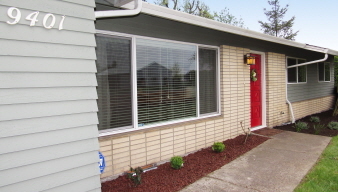 Beautifully remodeled one-level Mid-Century Ranch. Incredible upgrades: new cabinetry,slab granite island,glass tile backsplash,SS appliances,faucets, gorgeous laminate floors,lighting,bathroom vanities,designer paint,newer roof,ductless heat pump,vinyl windows,water heater,patio & huge fenced back yard w/ dog run.Extra parking & poss. RV parking on left. Easy access to I-205, shops & restaurants at Vancouver Mall-this is a must see!